Does the Call Center Need Visual IVR? 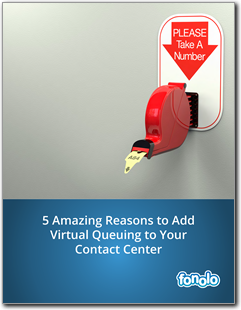 The IVR experience (“press 1 for this… press 2 for that…”) has been part of the contact center for so long, it seems like the two are destined to be conjoined forever. But will it be so? The nature of customer service is changing rapidly. New channels of communications – web, mobile and social – have changed the game dramatically. Meanwhile, consumer expectations are so high that delivering a flawless experience has become vital to business success. A study from YouGov shows that 76% of respondents said, “just one unpleasant contact center experience was likely to make them take their business elsewhere”. Yet, IVRs are almost universally despised by consumers. In order to avoid becoming a bigger liability to the customer experience, tomorrow’s IVR will have to change and adapt. If you’re thinking, “it’s about damn time!”, you’re not alone. According to a report by J.D. Power and Associates, a good IVR experience is quite rare. They found that IVR is a “weak link” for most organizations which is especially troubling when paired with their other finding: 33% of overall caller satisfaction is determined by the IVR experience. 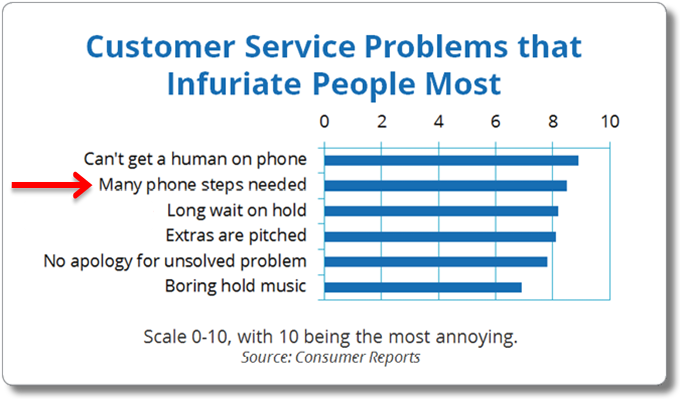 Their survey revealed that a bad IVR experience makes situations worse and turns neutral customers into dissatisfied ones. Isn’t the voice channel declining anyway? It’s true that the rise of self-service options decreases the quantity of transactions that need a live conversation (as both the tools get better and consumers get more comfortable with them). But, there will always be cases where self-serve tools fall short. In fact, the phone channel still accounts for the 80% of inbound customer service interactions (according to Contact Babel). Because self-service is handling more of the mundane tasks, the inquiries that lead to a live agent are going to be more complicated and more likely to involve an upset customer. These are precisely the “make-or-break” moments for a brand. So if we’re stuck with IVR, we might as well make it, well, less annoying. One way to do that is to make the menu dynamic and optimized. For example, UK-based HTK has an IVR platform that builds a personalized call-flow for each customer during the first seconds of their call. Watch the video here. For almost a decade, companies have tried to replace the dial-pad with speech-recognition technology. The results have often fallen far short of the vision, serving as fodder for many comedy routines. Boston-based Interactions is trying to overcome this by using artificial intelligence to replace the “flow-chart” based approach that typically drives an IVR system. This technology got a big boost when it acquired AT&T’s Natural Language Understanding Platform last year. IBM is also hoping to contribute to the enlightening of IVRs. They’ve recently invited developers to take advantage of their “cognitive computing” using a cloud platform called Bluemix. That system has pre-built modules for “User Modeling” and “Q&A” that, in theory, could be combined to make a truly intelligent front end to the call center that can learn as callers use it. Far out, man. A little closer to earth, there’s another approach to improving IVRs which focusses on using new visual channels. The traditional “press 1 for this…” interaction suffers from two big constraints inherent in its design: 1) Audio is a poor way to listen to long and numerous options and 2) the numeric keypad is a poor system for data entry and navigation. Luckily, the two platforms that have become dominant in customer service: web and mobile, are both ideal for moving past these constraints. 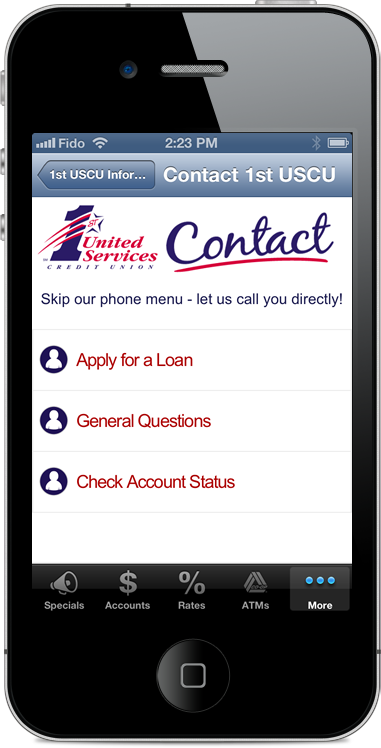 There have been some great implementations that show the promise of the great visual IVR experience. For example, here is a tour of a project Genesys did with French insurance company GroupAMA. We're in agreement all of the time. One point that VoxPeritus looks for with our clients is what drives a voice call? As you mention, increasingly it is a digital transaction gone wrong, and that's where Fonolo offers a great solution to integrate digital with voice with a great customer experience. However, calls still arrive from "out of the blue" where the caller never touched the digital offering, and that's where the old "Bugaboo" of routing being the devil behind the details in IVRs. One small change can save companies millions of dollars per year with no new technology. When calls are reactive to a letter or email, provide a unique phone number where the customer bypasses the IVR and goes directly to the correct skill for that transaction. This has been available since the Stone Ages of Call Centers, yet it is so rare, I can't remember anyone doing so. Thanks for the comment Kevin! Great points. We'll have an Account Manager contact you.